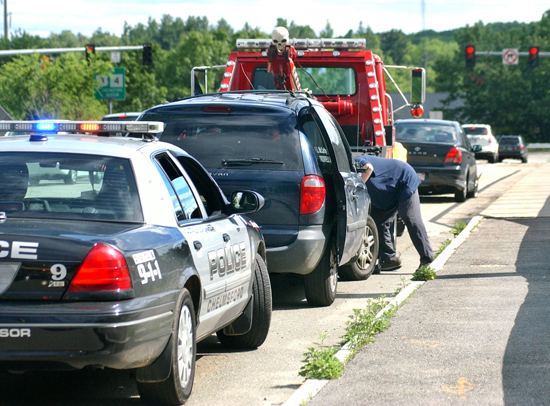 Chelmsford Police were called to the Drum Hill Rotary today at 3:11 p.m., for a report of a motor vehicle crash in which a school vehicle rolled over. I’ve seen reports that this was a bus, but it was actually a minivan equipped with bus lights that is owned by the Lighthouse School in Chelmford, according to Lt. James Spinney. All photos in this entry are by Bob Whitaker. “A minivan from the Lighthouse School was coming up Northern Avenue and entering the rotary when it appears a sedan heading from the Drum Hill area to Route 3 North hit the minivan in the intersection,” Spinney said. The impact caused the minivan, pictured below, to rollover. Two teenage girls, 17 or 18 years old, were in the Toyota, and were taken to local hospitals for treatment of minor injuries. Spinney said an adult male was driving the minivan, with two students, 16- and 17-years-old, riding in the van as passengers. They were not seriously injured, but all three were taken to Lowell General Hospital as a precaution. Spinney said police are still investigating to determine whether the Toyota had a green light. School officials were notified of the accident. Police continue to investigate. The drivers involved could not immediately be identified since reports are still being completed. 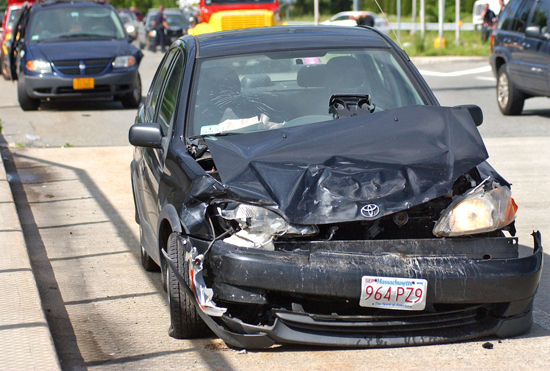 This entry was posted in Crashes and tagged chelmsford, crash, school bus. Bookmark the permalink.